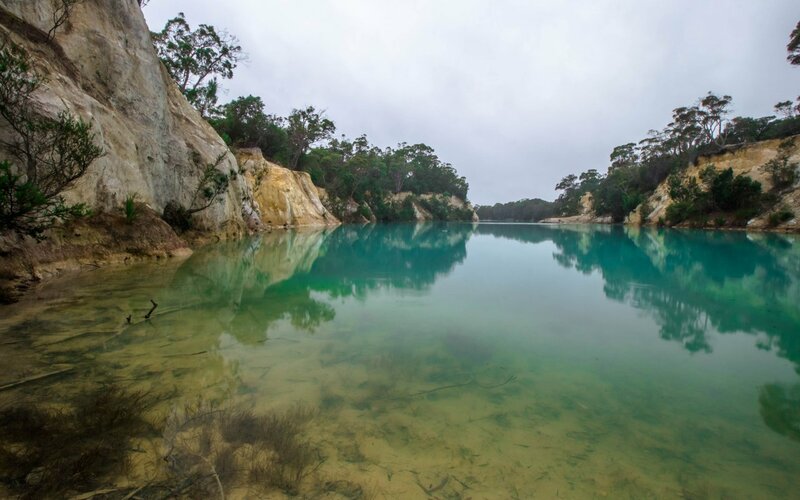 The Little Blue Lake of Mount Gambier is a popular tourist attraction in the region of Mount Gambier. Only 11 km southwest of Mount Gambier is the Little Blue Lake, those driving here should look for the turnoff near the Bellum Hotel. The Little Blue Lake is a small lake where bluish water used to be crystal clear. However, the lake water has turned into a dark green due to excessive pollution in recent times. This lake's greenish color was due to its water's excessive algae growth. The lake has now become clean and clear following current cleaning projects. The Little Blue Lake is this area's popular diving and swimming spot, with lots of people coming here to enjoy the beautiful scenery. The local council has built a stepped walkway because of its high popularity, which leads to a floating pontoon on the lake. Swimmers will find it easy to get to the lake and swim in the water with such options.